GFCI outlets offer a great electrical safety barrier between you and the supply of electricity in your home. By installing these GFCI outlets in your home according to the instructions, you have a better chance of them functioning properly. However, you should also follow the periodic testing of these devices to ensure they remain functioning optimally throughout the years to come. GFCI's come equipped with a test button to quickly and effectively test the functionality of the device. Simply push the button and see if it trips. If so, the device is functioning properly as a safety device. A GFCI outlet also is equipped with a reset button. Its function is to restore the GFCI back to its protected state and ready it for protection once more. I'd check the outlet. To reset the GFCI, simply press the reset button. To double-check it's working once again, simply use a voltage tester and test the outlet for voltage. If you can verify voltage, you have successfully reset the GFCI outlet. A two-wire GFCI outlet is connected in a three-wire circuit. In this instance, a two-pole GFCI circuit breaker is to be installed to protect the circuitry. A GFCI white circuit conductor is connected to the load side of the GFCI instead of the line side. The physical length of the circuit run the GFCI is protecting is too long. The general rule is not to exceed 250 feet or the circuit may encounter a capacitive leak to ground, causing the GFCI to fail. GFCI's are intended to open the circuit if unsafe and render any shock minimal. If I remember correctly, I believe the GFCI reacts in one/one millionth of a second. That's faster than you can blink your eye. So given that number, I'd say we're lucky to have them watching out over us! Remember to use GFCI outlets or circuit breakers on circuit that supply power to areas around water. In kitchens near sinks, bathrooms, utility rooms, garages, outside your home, swimming pools, spas, hot tubs, and even basements are all potentially wet areas that GFCI protection is required. Getting shocked is the last thing you want, so get GFCi protection installed and make your home safe! It's a small price to pay to protect your family from the dangers of electrical shock. At a cost of under $10 in most cases, it is a viable addition to your home's electrical system and will bring your home's electrical system up to code. 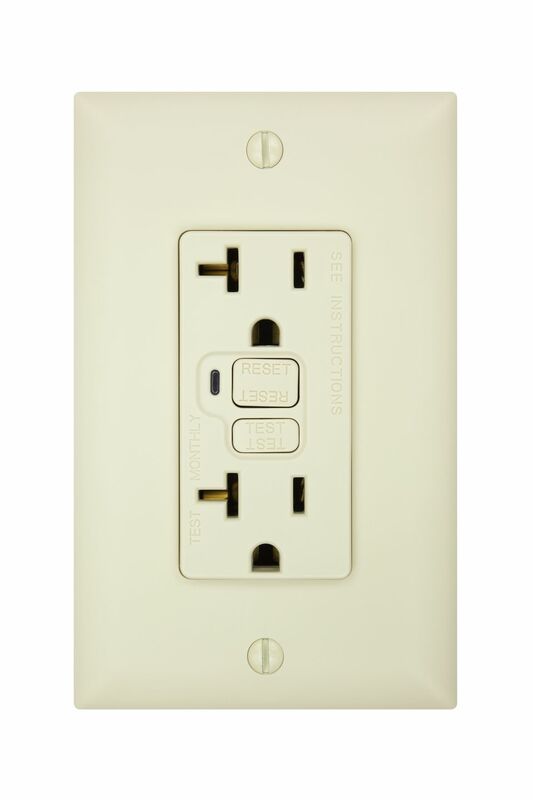 The GFCI outlets come in many different convenient colors to match your home's decor. GFCI outlets and breakers make your home safer and provide you with peace of mind. If you have not installed them yet in your home, I advise you to do it right away. Choose a GFCI...It's a trip!